Racing Weight by Matt Fitzgerald is essential reading for cyclists who want to reduce fat and increase lean muscle without compromising power. The best selling Racing Weight book goes into a lot of detail to dispel many myths surrounding how to diet and train effectively for endurance sports. If you’re the sort of person who needs to understand the rationale for a new approach to eating and training then we recommend you buy the Racing Weight book. The easiest way to improve your body composition is to remember this mantra; focus on maximum nutrients for minimum calories e.g. a handful of nuts and raisins, glass of milk, whole wheat bagel and some tuna is a lot of goodness for few calories and a good lunchtime snack or post workout meal. Although the over riding message in Racing Weight is that you should not worry about the individual proportions of fat, protein and carbohydrates in your diet it is worthwhile tracing your diet for a few days. The Training Peaks App is a great way to easily track your meals without having to get out the scales, just enter a typical meal into the search function and you’ll be able to build up an overall picture of your diet balance. Aiming for 20-40% fat, 40-80% carbs and 10-25% protein is the broad recommendation and reflects Matt Fitzgerald’s conviction that the quality of your diet is far more important than the balance of macronutrients. The Racing Weight book includes an excellent section reviewing the diets of some of the world’s best endurance athletes as well as a useful guide to timing your nutrition according to your daily training habits. In the age of the obesity epidemic Racing Weight hits the nail on the head when Fitzgerald explains how modern convenience food and our overly busy multitasking lives have destroyed our ability to listen to our appetite. One trick for controlling your appetite is to eat foods that will make you feel full. Soup for example is more filling than a sandwich and is less nutrient dense i.e. a bowl of vegetable soup has lots more nutrients in a greater volume but for less calories. Racing Weight supports and explains the most simple element of achieving your ideal body composition during the fat loss stage: eat less calories than you burn to lose weight. Again I’d recommend using the Training Peaks App to record all food eaten for two/three days then average your daily calories, you need to burn more calories through your resting metabolic rate and exercise than you eat to create a calorie deficit. Yo yo diets and a fixation on eating zero fat whilst training hard will just lead to over training and illness. The secret revealed in Racing Weight is how to reduce fat and increase lean muscle without compromising power. Again Fitzgerald’s advice is backed by lots of scientific research but boils down to getting the balance of training intensity correct so that you can train consistently and enable the body to make fitness adaptations over time. Using Pareto as a guide line aim for 80% zone 2 low intensity endurance work 20% higher intensity work. Good training is all about consistency, consistency consistency. Getting in 6 shorter sessions a week with a rest day is much more important than no sessions during week and a big “catch up” session on Saturday morning, Regular exercise tells your body to store calories in the muscles so you can use them, irregular exercise makes your body panic and be conservative by storing calories as fat in case you need it for an unexpected long exercise session (fight or flight self preservation instinct). My tip for this – complete a 30 minute run or bike before breakfast to get yourself starting the day with the correct habits. 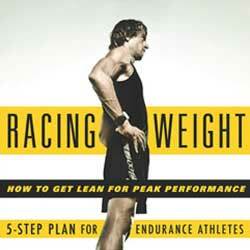 Buy Racing Weight today and take the first step to achieving your Racing Weight.